Try this Creamy Yogurt Dressing as a quick snack idea. Works great on Salads, Baked potatoes, French Fries and even as a Marinade. Healthy Substitute. Do you know the comic depictions of someone walking around with a cloud over their head and rain pouring down? Yet, everyone around them is bone dry? This weekend, I felt like that was me in the cartoon There was so much rain in Florida this weekend, it caused severe flooding in most of the state. We hadn’t had any rain for a long time, so, it felt like nature was making up for lost time. I spent the day running around in Downtown Orlando and the rain was merciless. My umbrella was a coward and gave up almost immediately! It left me soaked through and through. Not to mention, everything in my bag turned wet and useless. The funniest part was that the rain stopped the INSTANT I unlocked my front door!! I laughed and Alanis Morissette’s, “Isn’t it Ironic, Don’t you think?” started playing in my head. I thought to myself that, once in a while, it is good to get soaked. My soul needed to experience this level of drenching. It has made me humble today and reminded me that, at the very least, nature likes me enough to shower (pun intended) me with attention. I made myself a nice hot toddy and plopped in front of my iPad for the rest of the night. Yes, I tend to have very exciting Saturday nights. Today’s creamy yogurt recipe was actually a prelude to my hearty & loaded baked potato recipe. It is perfect topping for it. The creamy yogurt dressing is going to be a topping on a baked potato that is just to die for! However, this yogurt dressing works great in any meal or snack. If you have a spinach salad recipe, use this as the dressing. Or, if you don’t like heavy sour cream in your nachos, top it with this creamy yogurt dressing. Any variety of vegan yogurt will work great in this recipe. I went with Greek Yogurt because it is denser than regular yogurt. Do you have an interesting Ironic story that you want to share? Tell me about it in the comments below. P/S: I also topped this creamy yogurt dressing on my Lean Cuisine Tostada recipe. Transfer to a glass jar and store overnight. Serve this Creamy Yogurt Dressing on Salads, Potatoes, Nachos, Marinade or as a dip. This looks great! Like a healthy ranch dressing. I can’t wait to try it. We have had an incredible amount of rain here in Georgia. Loved reading about downtown Orlando. We use to live in Orlando and I love be reminded of good times there. I am even more in love with this dressing. Yogurt is probably my favorite ingredients. I love the versatility of this dressing. I can think of a million uses for this!! So funny about the rain stopping! Can’t wait to try this…it looks so delicious, Rini! We always make our own dressings, but rarely yogurt ones. Time to change that! 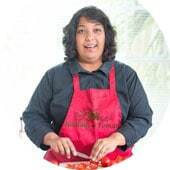 I love yogurt on sauces and dressings, your recipe looks great seems would go with almost everything, yummy! Your creamy yogurt dressing looks really delicious, creamy and super healthy. Perfect for salads, thank you! We still have lots of snow on the ground here, so rain would actually be nice! This dressing sounds really great and I bet a curried potato dish would pair perfectly with it. I found your dressing recipe over on Pinterest and had to stop by to say how yummy it looks. I’ve linked to it on my weekend healthy recipes roundup over on my blog, and can’t wait to give it a try. Thank you so much, Kristi. I really appreciate it. Thank you for featuring my recipe in your roundup. This sounds like a yummy dressing, it would make a great dips for veggies! I can definitely see myself using this as a topping or even as a dipping sauce for oven fries! The rain always comes at the wrong time here in California too. I love how and delicious creamy this dressing is, and healthy too. 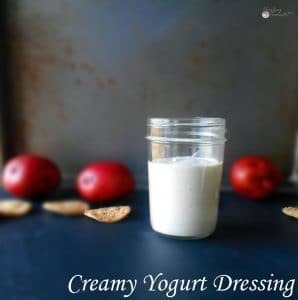 I dont think I’ve ever seen a yogurt dressing this looks great, I can’t wait to try it!! I am looking forward to the next post. My grandma used to put plain yogurt on baked potatoes instead of sour cream and the seasonings you’ve added will have created an amazing flavor. Thank you, Michelle. I tend to prefer yogurt over the heavy sour creams.